Over the last year or two, books about mathematics have become fashionable. For example, a biography of John Nash, a couple of biographies of Paul Erdos, and two histories of Fermat’s Last Theorem have all become bestsellers. Storytelling has played a major role in the success of all these books, but in each case the stories relate to the mathematicians rather than the mathematics. 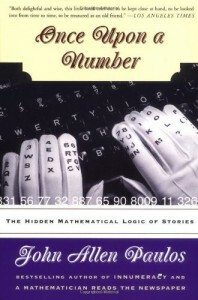 In “Once Upon a Number” by John Allen Paulos the the situation is reversed – the author is not interested in stories that involve mathematicians, but instead focuses on stories that revolve around mathematics. These stories provide an ideal environment for non-mathematicians to encounter mathematical ideas and examine them in comfort, without the fear usually associated with the subject. An example of one of Paulos’s stories relates to the trial of O.J. Simpson, a surprisingly rich source of mathematical anecdotes. During the trial, Alan Dershowitz, Simpson’s attorney, repeatedly declared that since fewer than 1 in 1,000 woman who are abused by their mates go on to be killed by them, the spousal abuse in the Simpsons’s marriage was irrelevant to the case. In effect, Dershowitz is telling a story and then tries to persuade the jury to accept his conclusion. At first sight his reasoning might seem to make sense. However, Paulos points out that Dershowitz’s argument is nothing more than a non sequiter hidden within a wonderfully sneaky story. If Nicole Simpson were still alive, then it would be fair to say that it would be unlikely that in the future she would be killed by her abuser. But we know that Nicole Simpson is dead, and the more relevant fact is that 80 per cent of women in abusive relationships who are murderered, are killed by their partners. One of the great lessons of Paulos’s book is to be warey of who is telling the story, which facts they include, and more importantly which facts they exclude. In another story, Paulos points out that one way to motivate our problem solving skills is to couch a mathematical riddle in terms of a story that arouses one of our primeval instincts. To demonstrate this, he asks us to imagine a deck of cards such that each card has a letter on one side and a number on the other. Four cards are placed on the table, so that we can see the sequence D, F, 3, 2. The question is this: which two cards must you turn over to demonstrate that if a card has a D on one side, it has a 3 on the other? Most people will turn over cards D and 3, but, in fact, you should turn over D and 2. The question is not difficult, and yet instinct misleads most people. However, consider the following problem. A bouncer at a bar must throw out underage drinkers. There are four people at the bar, and he knows they are a beer drinker, a cola drinker, a 28-year-old and a 16-year-old. Which two should he interrogate further? In contrast to the first proble, which is essentially identical, most people are correct in identifying the beer drinker and the 16-year-old. Paulos points to research in evolutionary pyschology that suggests we are brains have evolved to spot cheats, and hence a mathematical problem that exploits this talent is easier for us to deal with than an abstract version of the same problem. In addition to looking at mathematical problems within the context of stories, Paulos attempts to draw parallels between mathematics and stories in general. For example, he argues that we can interpret the structure of a joke in terms of catastrophe theory – the punchline confounds expectation, which is equivalent to a discontinuity. In general, Paulos’s observations are intriguing, but sometimes the analogies and conclusions seem slightly tenuous. When discussing the rationalization of coincidences, he warns readers that “because the stories we believe become, at least metaphorically, a part of us, we are disposed, perhaps out of a sense of self-preservation, to look always for their confirmation, seldom their disconfirmation.” Paulos himself seems to be occassionally guilty of this crime, but not to such an extent to spoil his overall argument. Popularisers of mathematics often rely on a standard collection of tried and trusted tales to painlessly illustrate particular points, and anyone who regularly reads books on the subject will have had the experience of encountering the same old stories again and again. These stories are often so delightful that we do not mind being reminded of them, but one of Paulos’s great strengths is his ability to invent new stories, or at least add new twists to old ones, and it seems fitting to end with a brief summary of one of these. The traditional story concerns two students with mud on the foreheads, each seeing the other’s smudge, but each unaware of the their own. Their professor enters the room, and states that at least one of them has a smudge on their forehead. This is something that they already know, but the result of this apparently redundant information is that both students, after hesitating for a short while, simultaneously wipe the smudge from their foreheads. The first student reasons that if his was clean, then the second student would see this and immediately realise that the smudge must be on his forehead. Because there is no instant reaction, the first student knows that he must have a smudge, and wipes his forehead. The second student goes through the same thought process. The problem can be extended to several muddy students, and as long as the professor says that at least one of them has a smudge, then they all realise, after a pause proportional to the number of students, that they all have a smudge. In Paulos’s spicier version of the story, there are 50 married couples, and each woman knows immediately when another woman’s husband has been unfaithful but never when her own has. The statutes of the village require that if a woman can prove her husband had been unfaithful, she must kill him that very day. As it happens, all 50 of the men have been unfaithful. Even though all the women are statute-abiding and rational, nothing happens until the village matriarch, who has been on a long vacation, returns and says that there is at least one philandering husband in the village. Nothing happens for 49 days, but on the fiftieth day, after a process of simultaneous ‘meta-reasoning’ there is a bloodbath and all the husbands are slaughtered. This is a wonderful story, but Paulos takes it one step further, by retelling it in terms of the Asian currency crisis. Replace the wives for investors in different countries, their uneasiness about infidelity for nervousnous about the markets, and slaying husbands for selling stocks. Each market suspects that the other markets are weak, but are unaware of their own position, until the Malaysian Prime Minister (the matriach) gave a speech that triggered the crisis. The crash was not immediate, and perhaps the lengthy delay was a cosequence of a lengthy process of meta-reasoning.